The rise of e-commerce and rapid delivery logistics has pushed construction in New York Cityʼs commercial warehouse sector to record levels. Since 2013, the city has experienced has seen the construction of warehouse increase from 880,000 s/f to over four million square feet in 2017. 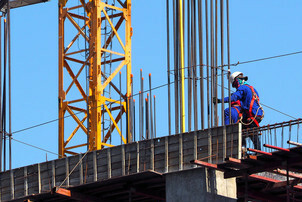 The development, which exclude manufacturer-owned spaces, totaled $2 billion between 2013 and 2017 and accounted for eight percent of all commercial construction over that time according to a New York Building Congress review of construction starts data from Dodge Data & Analytics. The report found that construction work on commercial space totaled $23.8 billion between 2013 and 2017, producing a total of over 73 million new square feet of space. The last three years showed the strongest growth, with each year topping $5 billion and 16 million square feet of new commercial construction. “As more businesses continue to call New York home, building new, world-class commercial spaces is more important than ever,” said New York Building Congress president & CEO Carlo A. Scissura. Construction work on office space totaled over $12.9 billion between 2013 and 2017 and accounted for over half of all commercial construction over that time (54 percent). Over 22 million square feet of new office space was built over the past five years. The last three years of new office construction reached a record high, each year exceeding $2 billion in construction starts, buoyed by new development in Hudson Yards and the World Trade Center. Construction work on retail space, which includes stores and restaurants, totaled $2.8 billion between 2013 and 2017 and accounted for 12 percent of all commercial construction over that time. The sector has experienced consistent growth each year, adding over a million square feet of new retail space across the five boroughs. Manhattan retail construction remains high but work in Staten Island and Brooklyn were major drivers the market. Construction work on hotels totaled over $4.7 billion between 2013 and 2017 and accounted for 20 percent of all commercial construction during that period. The last five years of hotel construction added 15 million sf of new space to the city. This continues the trend seen over the last decade marked by an astonishing 32 percent increase in hotel rooms. There are now over 115,500 hotel rooms and 630 hotel properties in the five boroughs.